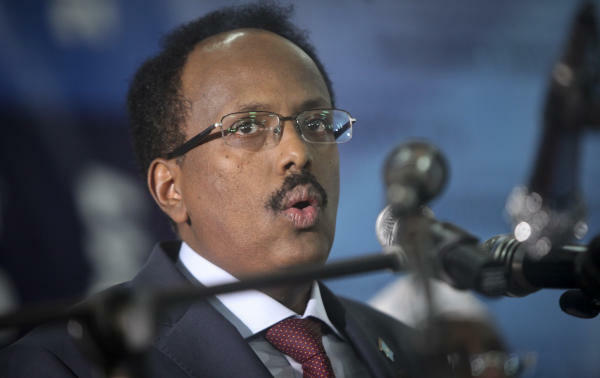 Cairo – Somali President Mohammed Abdullahi Mohammed announced on Thursday that he had introduced important changes in the army command and security and intelligence agencies in wake of his declaration of war against extremist groups. He chaired on Thursday what could be described as his war council during a government meeting that saw the appointment of new security chiefs. According to a presidential decree, Mohammed appointed a number of retired general to the most important military and security posts. Abdullah Sanboushli was appointed director of national security and intelligence, Ahmed Aarfish was appointed army commander, Abdullah Aanoud was appointed chief of staff and Abdul Hakim Saeed was appointed chief of police. Mohammed, speaking days after US President Donald Trump’s administration granted the US military broader authority to carry out air strikes in Somalia, said tackling the al-Qaeda-linked al-Shebaab insurgents was his top priority. “We have ordered all the security forces and military to be ready for making peace and today there is a new change in the military commanders, security officials,” Mohammed, dressed in military uniform, told reporters. He called on al-Shebaab insurgents to surrender within 60 days in return for education and jobs. Somalia has been at war since 1991, when clan-based warlords overthrew the president then turned on each other. A widespread drought has brought the country to the brink of famine and the UN says half the population will need aid by July. US forces have been carrying out drone strikes in Somalia in support of the government. Trump has given his military broader powers to attack militants even if they are not engaging partnered forces. Mohamed did not mention the new US directive, but emphasized that Somali troops should take the lead and added in a statement: “We want to pardon the Somali youth who were misled by al-Shebaab. “The government cordially welcomes them. We shall give them education; we shall create jobs for them. We do not want to kill our youth. We urge you again to leave al-Shebaab as soon as possible. Al-Shebaab is carrying out increasingly deadly bombings despite losing most of its territory to a 22,000-strong African Union peacekeepers supporting the Somali government. The group aims to expel the peacekeepers and topple Somalia’s Western-backed government. Among the new president’s chief challenges will be paying his military, who rampaged through the streets of Mogadishu earlier this year, saying they had not received their $100 salaries for several months.